Compared to the Nano it planes quite a bit earlier, which is great as the Nano gets going a lot quicker than a traditional wave board as is. I'm 70kg so 95L is a big board but on the water it doesn't feel big at all and it's the most comfortable and cruisey freewave I have ever tried, which was my second requirement as my knees aren't what they use to be. This thing has a huge wind range and eats chop for breakfast, I have had it out in 18 - 22 on my 4.8m and up to 30 knots on my 4.4m without any issue. Where it comes it to its own is when the wind is gusty/patchy, all that volume under foot lets you keep on planing. The stock thruster setup is really well suited to this board, the small 20cm rear means it doesn't get skittish and tail walk when you get over powered and the largish side fins really help getting up wind. This thing is built for comfort and not a rocket ship so if you're a white knuckle speed junkie try the Fox, I had a go of the 105 and its a beast of a freerace board. I tried the Dyno as a single fin with a 27cm and 24cm freewave and it was definitely faster but you will have to work harder to get up wind. An upright G10 freerace/freeride fin is the go if that's what you are after. I much prefer it in the stock thruster setup where it rewards a more wave stance where you keep your weight more centered and forward, I find it can spin out if you load up the stock rear fin too much when you getting going. If you're coming from a freeride background then I would suggest investing in a larger G10 freewave to get you started but I found the stock thruster the most versatile setup. There is a lot of volume under your feet which makes gybing crazy easy as you just float through the turns and that volume under foot comes in handy for jumps as well. This thing loves to jump and gets great pop off even the smallest ramp, I do better forwards on the Dyno compared to the Nano which was a surprise. You can get it to really chug up wind too which is great in the waves. Strangely enough you don't notice the extra volume under foot when you're blasting around in chop. In our cross on bay waves it goes surprisingly well, Nano has the edge here but the Dyno is not far behind. You can really pivot it round on that back fin which is fun. Was lucky enough to get it out in 1-2 foot cross/slightly off conditions on the weekend in 18-22 knots and was blown away at how much fun it was. The up wind performance and all that float made a mediocre session a fun one, it requires a bit more commitment to get a decent turn compared to my 83L Nano but considering its 25 liters over my weight it did great! I wish the Dyno was on the market 5 years ago when I started getting into the waves after years of bump and jump, it would have made the journey so much more fun. If you looking at a really fun freewave/freeride board for the bay that will serve you well if you ever venture out or want to transition into the waves give the Dyno a go if you get the chance. Don't be shy to go big either, your weight in kgs + 25L is the money shot for a light - medium wind strength all rounder I reckon. Here is a vid of the Dyno in the waves from the weekend and one from last seasons demo day to give you an idea of how it goes. yep agree with the above ,I have got the 105ltr dyno im 85kg and its a fantastic light wind board from blasting around and catching a few waves very happy with it . Yep, 3rd that. I'm 83 kg and i have the 115 L Dyno as my light wind wave / flat water board. Mainly use it with a 6.7. Had it out about 6 times so far. Mostly conditions just strong enough to plane with 6.7, and waves varied between overhead cross shore to 1-2 ft cross onshore. I use the stock sides and a 26 cm center for the 6.7. Stock center is fine with 6.7 when dead cross shore but need a bit more oomph for cross onshore with the 6.7. Jibing is like its on autopilot. Easy to plane out of every jibe. Wave rides really well for a board 30 L greater than my weight in kg. 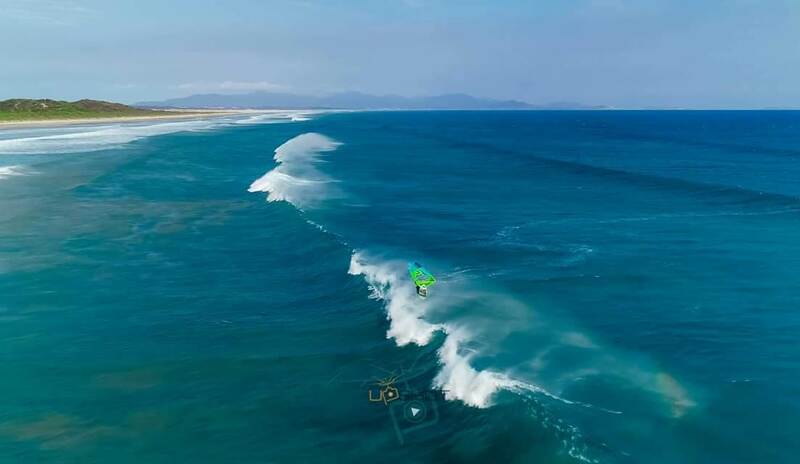 In the light winds I bought it for, chop on the wave face / wide tail isn't an issue, it carves a beautiful bottom turn and holds its speed really well in cross onshore less than powerful surf. It is happy to snap or carve through the top turn. The finish and quality of the board is fantastic, and clearly a lot of thought went into the fittings. The board is a keeper. If I had to find a criticism, it is that the volume feels less than stated. There is less thickness / volume in the nose in front of the mast track than my previous FSW. If I had to guess the volume I'd say it feels like 105 L, which is probably why I find it such a good wave rider. So maybe not a criticism, just an FYI when choosing the right size? And how good is that red wingnut hex key that does the foot straps, fins and battens! Thought it was a bit of a gimmick at first but its a winner. Yep, loving the Dyno, bought the 85L last month and it compliments my foiling, if the wind drops I just grab the foil board and chuck on the same sail, last night was foiling on the 5.9, wind picked up so I brought out the Dyno. Am using a 25cm fin as I was spinning out heaps on the standard 20cm. Goes up wind really well and great for blasting across the bay, light sailor, only 72kg. I'm in on this as well. 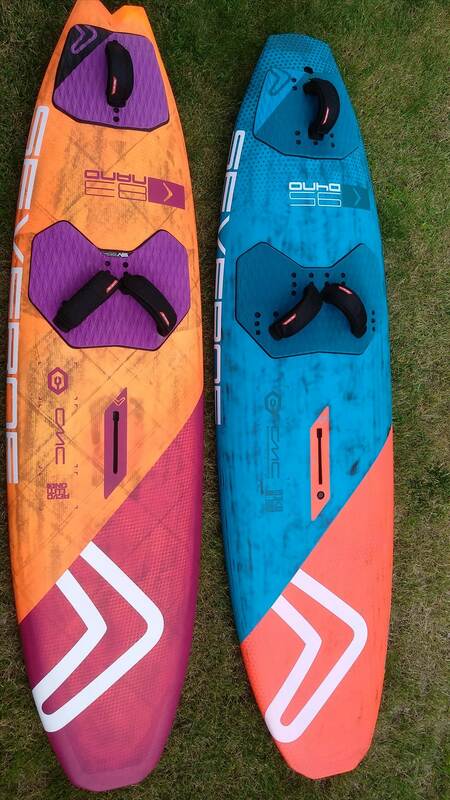 I have a Dyno 115 which has proven a fantastic bump and jump/ small wave board. Planes easily, throws around like nothing I've had before and is just a pleasure to sail. Have used sails up to 7.5 ( severne Gators) for light wind free ride / bump and jump and it still felt fabulous. The build and looks are great. One happy owner here! Sounds like a few others have had a good run with the Dyno, stehsegler latest review pretty much sums it up. Glad it's not all in my head. Got to give my 95L a go in bigger waves on Saturday and it went really well, volume distribution made chugging out and up wind a breeze. All that float made scrubbing on to waves a lot easier too. Was around 3 foot, a bit fat and around 15-20 knots cross shore. Big thumbs up. Stoked to hear everyone liking the Dyno so much. We'll have a bunch of them up at Coro's for the nationals so if anyone wants to try one out, look me up and i'll set you up with a board to try. Hoops, let me know if you need help testing the next round of Dyno prototypes. That said I am not sure much can be improved. I'm heading out to Coro's now. Looks like the wind's already in. The morning session should be good for a Dyno blast. I've also got some Nano's and Mako's if anyone wants to try them. I have a few custom Dyno/Nano boards as well. With the current crop of Severnes you've got a lot right! I now have two Foxes and the big Dyno and I'm stoked with them. The fox 140 has been a light wind revelation. Enjoy corros hopefully a good breeze for you! Great work on the Nano and Dyno Hoops, the 83L Nano was a real game changer for me too. Speed, pop and short length really helped with my forwards and the centralized volume gave me more float in the waves. Bay sailing here in Melbourne most of the time though where our best day would be a very average Corros session. Cross on wind swell mainly. Great watching Ben and Timo on their Nano's last October at Gnarloo, shows what it can do under competent feet. If I had to do it again though I reckon I might go with the 85L Dyno instead of the 83L Nano though, never going to be a gun wave sailor and the Dyno more fun in the bay. Hoops, when are you bringing those demo boards down to Margs? Was down there doing some testing with Scotty a few weeks ago. Didn't see ya there. I'll see what Huey's got in store over the next few weeks. It would be good to get down there again. Some drone footage from the other week courtesy of Duncan Banks. Definitely need a bit more work on my light wind forwards. Wind around 15-17 knots. Had a good Dyno 95 session today. Drove up to Lano pretty sure it was going to be howling. Not to be. I started off at South Passage on my 83 Nano and 5.2 S-1. It was really light and was barely planing at all. A few ok waves though. I went back in and got the Dyno 95. It changed a really average session into a great session. I sailed upwind to Main Break and had a really good jumping session for about half an hour and then did the downwind blast back to South Passage for a few fun wave rides. Fully planing and mobile the whole time on the Dyno. All good. I don't sail Main Break. Next time you're down I will though. How many kegs are you Hoops? Yep you are the same as me. Spring is here in the UK and we have some decent wind at last. I sailed at Hove today (March 2nd) and we had a patchy wind but the weather was warm enough for an easy session, with the water not feeling cold at all. I was also stoked to be on new gear today, so here's a board review. I'm perhaps late to the game but I bought a Severne Dyno in the 95 litre size, and the idea was that this is a very floaty wave board for me which I will use with my bigger wavesail sizes, up to 5.3 or 5.6m. The Dyno has been in production for more than a year already and it's supposedly a FSW or 'crossover' board, but it has rocker - and I'd seen others on them enough to know they sail down the line in waves like a true wave board. 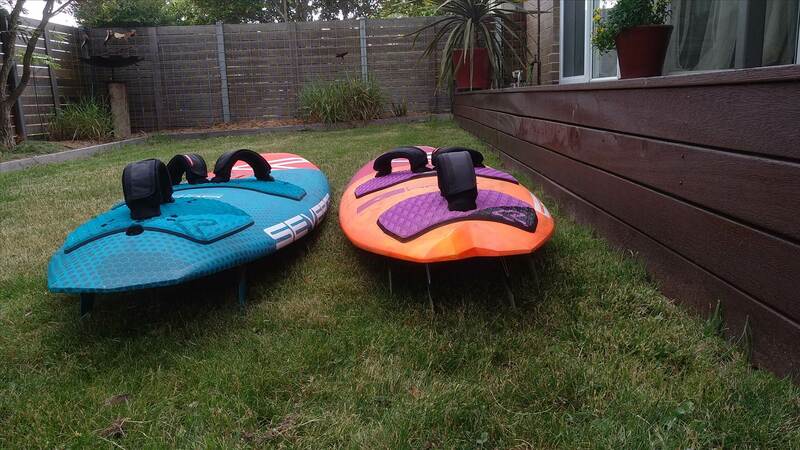 My need was for a bigger board that will be useful on onshore summer days and for when the wind is iffy, or patchy, and also to deal with the white water and downwind currents we get at our local sailing spots. Downwind currents often mean you can't plane easily, even when your sail feels full of wind. So the answer here is to get more float under your feet, and 95 litres probably sounds a lot for someone who normally weighs 75kilos. The weird thing about the Dyno is that the 95 didn't feel big at all, although I could probably uphaul it if I wanted to. Today's first session confirmed what a plug and play board this is, and I couldn't be happier. I was on a 4.8 rig this afternoon and that was enough to get the Dyno planing happily and the board never felt big, even later when the wind got up. I say it's corky but planted, even though that may sound like a contradiction. It's perhaps the concaves and hidden vee that eat the chop. The hull shape is also unusual in the way the volume is distributed, and you can stand in the straps at the tail without the board sinking, even when slogging. The sharp rails and fast rocker make this board plane early but I soon realised today that it planes even earlier with a bit of work because if you lean forwards when slogging that can actually make you plane later, and the board benefits from a bit of popping technique (where you push downwards against the buoyancy beneath your feet, whilst pumping onto the plane). Once planing, the board quickly accelerates to good speed, planing on the mid to rear section of the board, but with the nose staying low. The fins and straps are set well back on the Dyno, and today I found the board worked best with my 4.8 set with the deckplate set a bit back from the track's centre position - to help get my usual upright stance set up with the straps and fin positions. (Maybe I'll want the 5.3/5.7 rigs set with the mastfoot more centre track, for the same stance). Blasting sailors have different footstrap options with this board, and I'm guessing the front half of the mast track might be of use when using 6.5 rigs or bigger. It's the end of winter and I was wearing thin booties today, but even so I found I'd initially set the footstraps too big for my wide size 8 Hobbit feet. Those Australians must have big feet, because my frontstraps are now set on the minimum velcro setting. I've left the back strap bigger in the hope of getting my back foot nearer the rail - because the Dyno has such a wide chopper tail! My front straps are set inboard and as far forward as the three hole options allow, and my back strap is set as far back as I can get it - i.e. in the usual wave riding positions. The tri fin hull came with some nice G10 fins, with a 20cms powerbox fin in the rear and two 12.5cms thruster fins set in starboxes at the rails. Those three fins total to a lot of area compared to what I'm used to, but they didn't feel draggy or restricting in the turns today. I was expecting to need to experiment with a shorter centre fin, perhaps at 17 or 18cms, but I can now see that there's no rush on this. The turns were fine today, but at no point did I feel any signs of spinnout - a sign which in my experience often means you're over-finned for wavesailing. The other thing I noticed about the Dyno was how the wide nose helped with the top turn, because you can allow the whitewater to push the nose round in a dramatic tight cut back. This is something I'm looking forward to trying out in the bigger waves we sometimes get at Hove. If you have a Dyno then please let me know what you think. These are obviously my thoughts and first impressions after just one session, rather than an in-depth review. Basher is it possible for you to run a hose across to rear of the board perpendicular to the rail on the hull and let me know at what point the water attaches to the rail. if you keep hose perp to rail and move it towards the nose at a point the water will wrap the rail. keen to know how far forward the rail goes from hard to soft. Hi Gestalt, I doubt I'll find time to do that, because it sounds a bit too technical. But if you look at the Dyno hull it has very hard/sharp rails from the mid section to the rear. At the front is has more rounded rails but these rails are also 'lifted' by an extra bevel before the concaves start. I had a second session on the Dyno today so here's a bit more to add to the review above. Firstly, it was honking on the south coast of the UK today and with wild seas I never expected to be on with a 95 litre board. But the wind dropped lighter for a while at lunchtime and so I chanced my arm on the Dyno, at first on the 4.8m rig, like yesterday. As it turned out, the wind was increasing and we went through the gears. My 4.8 soon felt too big but at that stage the Dyno 95 was coping well with onshore wind, and with the bouncy sea conditions. I quickly changed down to my 4.4, and was soon overpowered on that, eventually ending the day overpowered on a 4.0m rig. But I did get enough time to realise that the Dyno 95 would be OK on flat water with a 4.4, even though that size sail is not in the board's official/recommended range. The first is that it is possible to be 'overboarded' with any design. When you are on too big a board it gets very 'flyaway' in the air and, with too much wind under the hull, you feel out of control. (I eventually changed down to an 80 litre board - which looked tiny when next to the Dyno, but was in fact a good change). The second issue is with the Dyno fins, as anticipated earlier. In 4.4 weather and bumpy seas, I was storming along at great speed and I soon found I had too much fin area (and 'lift) under my feet, with the board starting to tail-walk. This second issue (being 'overfinned') could however be solved by me fitting smaller fins for windy conditions. I reckon I can easily swap the 20cms centre fin for something like a 17 or 18cms version. Today's experience takes nothing away from the plusses about this board, and today was more about board and fin size. I weigh 75kgs or less, and I would happily have been on my Nuevo 73 this afternoon - had I remembered to put it in the van. As it was, by late afternoon my UltraKode 80 also felt too fast and too big in the 35-40mph wind we had today, as 'storm Freya' paid us a visit. But these were the upper wind limits of the Dyno 95 that I found today. I guess next I'll be looking to see how light a wind I can sail it in. maybe these new mph inspired designs will take the sport in a new and better direction. Got the Dyno out in decent 3 foot down the line conditions yesterday. 4.8m cross off just plaining. Can't believe how versatile this boat is, so comfortable in the turns given its size. Nice, looks like a fun day! Fantastic lookin spot you sail there! Getting more comfortable in the waves now and having so much fun on the Dyno in the light stuff.